We’re really pleased that our mobile learning has won a Brandon Hall Gold for the 2nd year running! 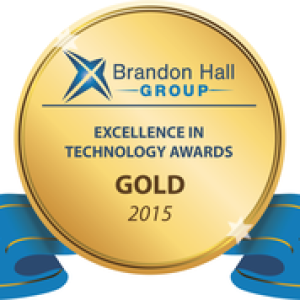 We were awarded Gold for the Best Advances in Mobile Learning 2015. Unlike our fellow awardees we didn’t submit for one single app, but instead described the broader mobile app strategy that we were running at Qualcomm, and the many different apps we have deployed. The award is an awesome confirmation from our peers that what we did at Qualcomm has value for other organisations too. So, what HAVE we been doing exactly? Enable mobility, in the widest possible sense. Getting the infrastructure and processes right to support lots of apps, from lots of vendors, and from many internal teams. Broaden the definition of “mobile learning” to include performance support, and any other mobile access to work-related information. Build an “employee appstore” which operates both as a catalog, or gateway to all Qualcomm apps as well as an analytics layer, providing insights into who is using which apps, when. Increase the number of apps available to employees. Whether core, or optional. And it’s working well. At the time of the award there were around 85 apps in the appstore which supports iOS, Android, WinPhone as well as some big-screen apps (web-apps). Over 75% of employees across the globe were logging in to use apps, over half of those doing so on their own, personal devices. For deeper info on the Qualcomm Employee Appstore see this article from 2014, or post some questions to this article, and we’ll provide extra information. The irony is that the dedicated team at Qualcomm who built this have disbanded and moved outwards to sow seeds of m-learning in other organisations. The award notification came in 1 week after the last of us left Qualcomm. The appstore has become embedded enough that Qualcomm’s internal IT team have taken over management of it. So – thanks again to Brandon Hall for the award, and to the awesome Qualcomm Mobile Learning team for building it! Qualcomm has actively participated in the recent mLearnCon 2013 and shared its mobile philosophy through a Keynote session by Tamar and several other insightful presentations by Geoff Steam and his team. Enterprise AppStores – for LEARNING! Question: How do you scale your enterprise mobile learning from one or two good apps, to a company wide mobile strategy? Do you have Guerrilla Learners?